It’s More than a Challenge. It’s a Celebration. A 100th anniversary deserves a big celebration. And this one is so big it fills the whole state. To commemorate the centennial of the founding of the National Park Service, Missouri’s national parks are hosting the Passport Challenge—a great way to experience the wealth of educational, cultural and recreational opportunities these local treasures have to offer. Begin your challenge by picking up a free Show-Me National Parks Passport at any of Missouri's six national parks. Each park has a stamping station located in the visitor center. Stamp your Passport on that park's page. If you have trouble locating the stamping station, ask a ranger for help! After collecting stamps from your first three parks, have your Passport verified and signed by a park ranger to receive your first prize. After visiting and collecting stamps at all six parks, have a ranger at any of the parks review your additional three stamps and sign your passport to receive your second prize. Prizes can be claimed in the Visitor Centers at any of the six Missouri national parks through December 31, 2017. Register your Passport at any time to enter to win the Grand Prize Drawing for four tickets to a 2018 season St. Louis or Kansas City home baseball game with a one-night stay at a Hotel. Meet the Challenge. Win these rewards. Sure, visiting Missouri’s diverse and fascinating national parks is rewarding on its own. But by joining the Missouri National Park Passport Challenge, you can receive fun, free prizes, too. 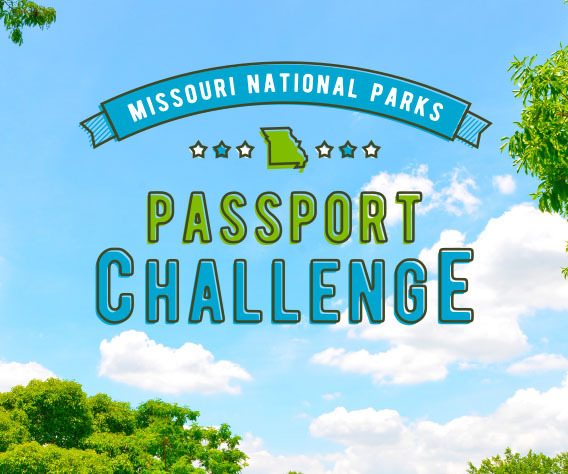 Get your Passport stamped at 3 parks, and receive a free Missouri National Parks Passport Challenge water bottle to quench your thirst on future adventures. Stamp your Passport at all 6 parks, and receive a commemorative “Challenge Accomplished” Passport Challenge drawstring backpack. No matter how many or few stamps you get, be sure to register your Passport using the unique code on the back cover to be entered to win the Grand Slam package—4 tickets to a 2018 season home baseball game at St. Louis or Kansas City, plus a 1-night stay at a hotel. The Missouri National Parks Passport Challenge begins on Saturday, August 27, 2016 and ends on Sunday, December 31, 2017. Visit 3 Missouri national parks to receive a souvenir water bottle. Visit all 6 Missouri national parks to receive a commemorative backpack. Prizes are subject to availability. Comparable prizes may be substituted. Passport stamps must be verified by a National Park Service ranger. Prizes can be redeemed at any of the Missouri national parks’ visitor centers. Please note, 2 visitor centers are closed over the winter: the Ozark National Scenic Riverways’ Round Spring Visitor Center and Alley Spring General Store and Mill. Please verify all park and visitor center days and hours of operation before visiting. See individual park pages for specific details. One Grand Prize will be awarded featuring 4 tickets to a 2018 season St. Louis or Kansas City home baseball game and a one-night hotel stay. The winner will be notified by Monday, January 8, 2018. To enter the Grand Prize Drawing, visit MONationalParks.com/enter and register your Passport using the unique code printed on the back of your booklet. Only 1 Passport per person, per email address, may be submitted for prizes or registered for the Grand Prize Drawing. Limit 4 passports per household.